You get dressed everyday. Depending on how you’re feeling it can be a pleasant or annoying experience. Common annoyances include, “I have nothing to wear.” “My clothes are just not fitting like they used to.” (Your self talk may likely be more belligerent, but I won’t go there.) “Where is my favorite jacket, skirt, sweater, etc. ?” I can’t necessarily provide a solution for all of these woes, but I can recommend some great closet organizing products that transform your wardrobe. Nonslip – These skinny hangers not only save space, but they also keep your clothing on the hangers as well as prevent hanger bumps. Pant Hangers – Rather than folding your pants over regular hangers, use open ended hangers for easy access. Sturdy Hangers – Wooden hangers are great for heavy items like suits and jackets. However, the curved versions can take up a lot of space. 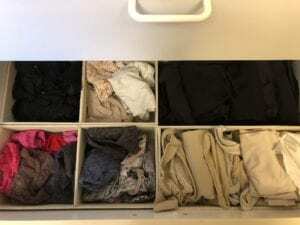 Drawer Organizers – Do your dresser drawers always look like you just dumped your laundry basket into a rectangular container? Is it hard for your to easily find items in those drawers? 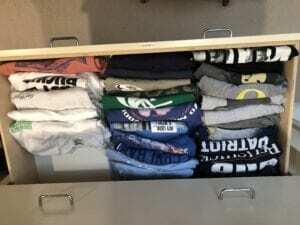 Drawer organizers are great for converting a wide, open drawer into sections. They also make it easier to see and find the items you’re looking for. You can section items by bras/underwear, darks/lights, regular socks/athletic socks, etc. Make them work for your wardrobe and way of thinking. There is no right or wrong. Accessory Hangers – There are many options for tie, belt, and scarf organizers. 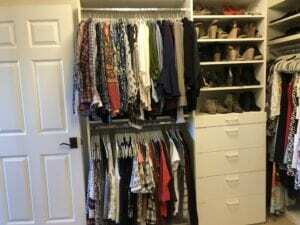 Whatever you choose make sure it accommodates the amount of the accessory your are trying to organize, i.e. there are enough hooks for each of your belts or ties. For scarves, I prefer storing them folded or rolled in a drawer vs hanging them. Typical scarf holders often don’t hold larger, bulkier scarves or they make your scarves difficult to access because everything is clumped together. Racks – Depending on your space you can choose a floor based or door rack solution. 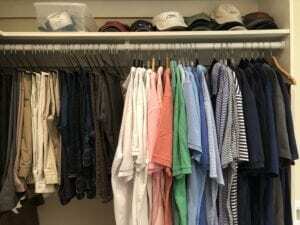 Cubbies – If you can sacrifice hanging space in your closet, go with a closet rod solution. Otherwise a floor based cubbie system may work for you. Boxes – These work well for people who want to keep their shoes and boots dust free or like the visual of uniform boxes. You can use the boxes your shoes came in or go with a clear version to really see each pair. 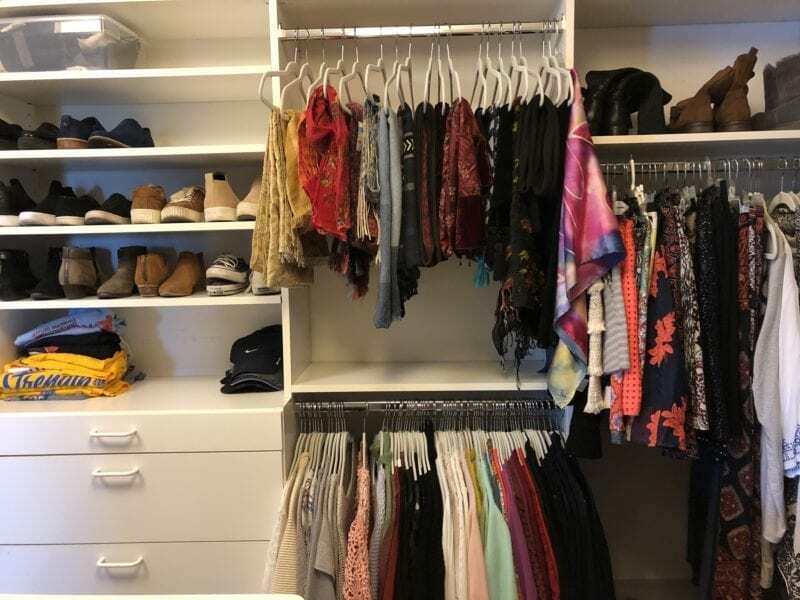 Arrangement – Grouping your clothes by like items can really help with the decision, “What do I want to wear?” You can arrange your clothing by type (short sleeve, long sleeve, pants, skirts, dresses, etc.) and/or by color (dark to light and prints together). 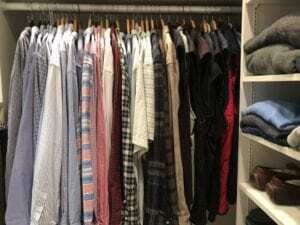 Hung clothing arranged by type and/or color not only makes your closet aesthetically pleasing but will likely lead you to appreciate the clothes you have, versus buying more. 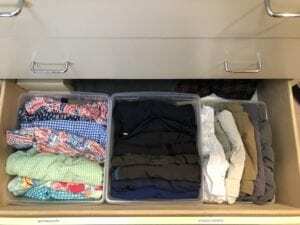 When it comes to your folded clothing, rather than stacking horizontally, think about folding it in a way that allows it to stand on end (photo below). 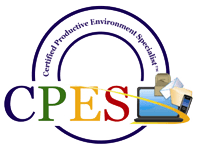 It allows you to see all your folded items versus rummaging around your drawer trying to find the article you want to wear.